Does the Eiruv cover a walk from Bay Harbor to the Shul? Unless you are redeeming the points yourself, which at 6MM a year is unlikely to be the case, 2% cashback is the way to go. It might need some work getting your desired credit line with a card like the Capital One Spark, but it's doable. That's what the Hammock is for. Is it bookable over the phone with UA? So the pic is in front of the Ritz. I just want to know if they accepted your free night cert purchased on DDF under somebody else’s also very Jewish name. No need for a cert. The Ritz now offers free nights for opponents of the state. Unless you returned by ship, you're missing a leg there (Following TLV-LAX). I land at 5:30am in BaAs and take off the next day at 7:30 to go to FTE. Am I crazy to spend that day going to Igauzu for 6-8 hours? Or should I just see BaAs? But I think this is everything. Are you saying you don't keep track of your flight history? EWR-FLL, PBI-TPA-JFK: JetBlue Y, Silver Airways Y+; Free. EWR-AUS-OAK, SFO-LAX-JFK: Southwest Y, Jetblue Y; 7764 WN + 10.7k B6 + $11.20. EWR-HNL-ITO-HNL-EWR: United F, Hawaiian F and Y+; Free. PHL-MIA-EZE, AEP-USH-AEP, EZE-MIA-EWR: American F and J, LATAM Y+, Aerolineas Argentinas F; 85k AS + 57.5k AA + $754.42. 36 segments, 47,297 miles flown, 1,314 average length. 295,964 miles + $1480.72. 24 new airports, 13 new countries, 12 new airlines, 8 new aircraft, 2 new continents, 1 new state. 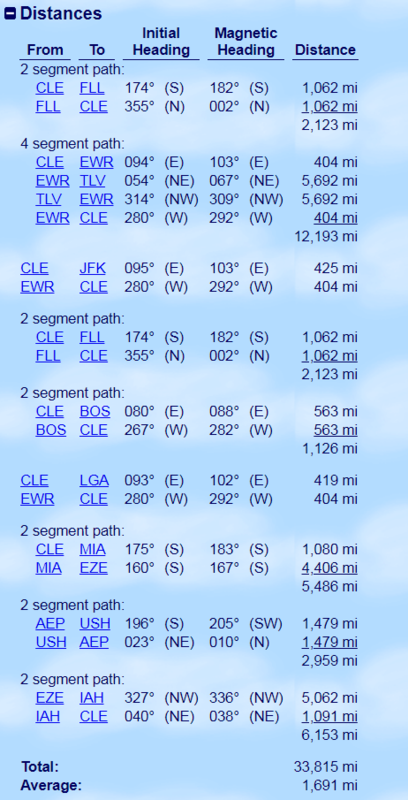 The year included both my shortest and longest flights to date: JRB-EWR @8 miles, and EWR-HNL @4962 miles. Sun-Thu, end of January. 2 days in Rome, the rest somewhere warm and relaxing. Nothing in particular, just a nice Airbnb villa with a pool or thereabouts. FWIU you won't find anything really warm in Europe, so I guess the question is which one is more important; Rome or warm weather afterwards? Not listing the ship ports? Should I send the 30k+ back? If you can send it to me that'll certainly help with my time spent on this.